Pradeep Kumar, Ben Wilson (aka Chewing Gum Man), Madge Gill, Nick Blinko, Ted Gordon, Damian LeBas, Syed Hasan, Kate Bradbury, Shafique Uddin, Pearl Alcock, Martha Grunenwaldt and Tim Holliman. From the miniature masterpieces of Pradeep Kumar and Ben Wilson aka Chewing Gum Man, monochrome drawings of Madge Gill, Nick Blinko, Ted Gordon, Damian LeBas, Syed Hasan and Kate Bradbury to the colourful paintings of Shafique Uddin, Pearl Alcock, Martha Grunenwaldt and Tim Holliman each artist has created their interpretation of the human face which, when seen all together in what is probably the smallest gallery in London, promises to be a memorable show for all. John Joseph Sheehy was born in the south west of Ireland in 1949. He immigrated to London in the 1950s and has been living in the city ever since. From 1965 until 1989 he worked as a builder and roofer, but endured lengthy spells of unemployment. He has experienced periods of homelessness and suffered mental health problems. He first began to paint in May 1999 at the suggestion of his psychotherapist. Early attempts revealed a natural ability to conjure powerful imagery from his imagination and memory. Now a prolific artist his creative talents know no limits. His output spans painting, pottery, sculpture, printmaking and photography, as well as writing plays and poetry. He paints with a passionate sense of urgency that is evident in his art. This, the first major exploration of British Outsider Art, offers an opportunity to examine the wealth of art that exists on the margins of the mainstream. The exhibition aims to present a broad range of drawing, painting and sculpture from British artists and collections representing the unique creations of spirited individuals who follow a singular creative path, exploring inner realms and capable of conveying a powerful message, but seeking neither recognition nor reward. 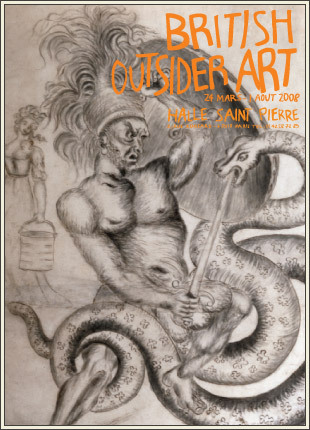 Here in the Halle Saint Pierre, artists from British collections are brought out of the shadows and placed in the spotlight to be observed and considered along with the legions of celebrated international Art Brut creators whose works have previously graced this established venue. Much of the work presented here is by individuals who have experienced mental illness. Historical archives house fascinating works by psychiatric patients, dating back to the beginning of the nineteenth century. But this is only part of the story. Also represented in the exhibition are artists whose output is the direct result of spiritualist experience or divine inspiration. Others simply stand firmly outside the mainstream in their creativity and often work for many years undiscovered. Some are more culturally aware but, true to their personal vision, remain uninfluenced by their contact with the work of others. These artists do not follow trends and often use improvised techniques rather than traditional methods of creation. Our first steps to discovering Outsider Art in Britain begin in the world's oldest institution for the care and treatment of people with mental health problems. Bethlem Royal Hospital, also known as Bedlam, was founded in 1247 at Bishopsgate, London. In 1735, the artist William Hogarth published A Rake's Progress, a series of eight engravings illustrating the decline and fall of Tom Rakewell, a wealthy young man who squanders his fortune on women and drink, and finds himself in Bethlem. The final plate, In Bedlam, shows a patient drawing on an asylum wall, and is thought to be the earliest depiction of a mentally ill artist at work. In 1900, the first exhibition of art by patients opened at Bethlem, arranged by the Chaplain, Revd. O'Donahue, who selected works from around the hospital. In 1913, an exhibition of psychotic art took place at Bethlem during an international medical congress. During its long history, Bethlem occupied several locations, with 1930 marking the hospital's last move to date, when it transferred to its current location in Beckenham, Kent. Today, a collection approaching one thousand pictures is held in the hospital's Archives and Museum. These range from works by unnamed patients to paintings by successful artists with mental health problems. The earliest works selected for this exhibition are by Jonathan Martin (1782­1838), confined in 1829 after his partially successful attempt to burn down York Minster. For many of the pictures in the Bethlem archive there is little surviving information other than a diagnostic description of the artist. Thus, in addition to a painting by Marion Patrick (1940­93), a sketch by E. Baron, drawings by Gilbert Price accompanied by a very personal vocabulary, and works of an artist known only as Jackie, we include in this exhibition a number of anonymous pieces. Several drawings are clearly the work of a single artist, name unknown ­ the powerful expressions of a tormented mind. One of the first people to study the art of mentally disturbed patients was Dr William A. F. Browne (1805­85). In 1838 Browne was appointed physician superintendent of the newly built Crichton Royal Hospital in Dumfries, Scotland. In 1839, eighty years before Hans Prinzhorn began his collection at the University Psychiatric Clinic in Heidelberg, Browne embarked on one of the first collections of art by mental patients in institutions. He assembled a large volume of work by psychotic patients and had it bound into three volumes. An enlightened and forward-thinking man, Browne had published two years previously a book entitled What Asylums Were, Are, and Ought To Be. His publication detailed how an ‘ideal asylum' should appear and operate. Browne sought to keep his patients busy, encouraging writing, art and drama and involving them in a host of activities long before the terms ‘occupational therapy' and ‘art therapy' had been invented. Browne wrote a paper entitled ‘Mad Artists' which was published in the Journal of Psychological Medicine and Mental Pathology in 1880 and gave the author's views on mental illness and its effect on established artists. Andrew Kennedy (1825­99) was a patient at the Crichton Royal Hospital when he began his prolific picture-making in 1882. Never previously exhibited, Kennedy's extraordinary drawings were probably kept by doctors for use in lectures to illustrate different aspects of mental illness rather than for their artistic value. The latter half of the nineteenth century saw an explosion in paranormal claims and interest in them, related to the new religion of Spiritualism. Many people were producing ‘spirit drawings', among them Georgiana Houghton (1814­84) who produced her first work in London in 1861. Madge Gill (1882­1961) was a classic mediumistic artist whose creative urge first surfaced in 1919. The first British solo show of the work of Scottie Wilson (1888­1972) took place in 1945 at the Arcade Gallery in London. The exhibition ran concurrently with Surrealist Diversity 1915­1945, which included such twentieth-century luminaries as Picasso, Miró and Man Ray. Wilson's work was admired by both Dubuffet and Picasso. Madge Gill and Scottie Wilson were among the artists featured in Roger Cardinal's seminal 1972 book Outsider Art, which introduced Jean Dubuffet's theories of Art Brut to an English-speaking audience and considered environmental creations such as Ferdinand Cheval's Palais Idéal and Simon Rodia's Watts Towers alongside works from early psychiatric collections and those gathered together by Dubuffet. 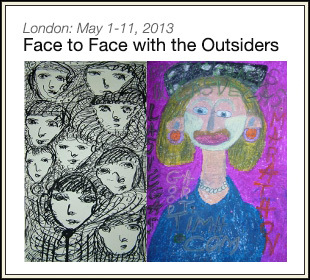 The term ‘Outsider Art' became an English language equivalent of Dubuffet's ‘Art Brut'. Artist and writer Victor Musgrave, owner of the pioneering Gallery One in London, also recognised the originality and power of Outsider Art. In 1979, he and Cardinal curated Outsiders for the Arts Council, at the Hayward Gallery, London. The exhibition received a mixed response. Many critics and art historians were quick to distance themselves from this type of production, questioning the acceptability of Outsider Art and perhaps perceiving the threat to their cultural establishment. In 1981, Musgrave founded the Outsider Archive, a body dedicated to the collection and study of Outsider Art, with the eventual aim of establishing a permanent exhibition space. With the help of a network of scouts and a large number of advocates and enthusiasts, Musgrave and, later, Monika Kinley gathered works by established artists from all over the world whilst making new discoveries close to home, including Tate Gallery attendant Perifimou (1916­2001), van driver Albert Louden (b. 1945) and Farouq Molloy (b. 1957), a switchboard operator at a local hospital. When plans for a permanent home failed to come to fruition, the collection was given on a long-term loan to the Irish Museum of Modern Art in Dublin. Joyce Laing, a pioneer art therapist in Scotland, began to collect Outsider Art in the 1970s, referring to it as Art Extraordinary. Recognising the innate talent of ordinary people expressing an intense personal vision, she gathered and began to exhibit works such as the stone carvings of Adam Christie (1868­1950) and a collection of anonymous works that had been salvaged from an old store building at the Royal Cornhill Hospital, Aberdeen and were believed to have been produced by a patient in Victorian times. Laing is Director of the Art Extraordinary Trust, located on the east coast of Scotland. The collection is open to the public during the summer months. Whilst some works in the collection were sourced from mental health institutions, Laing made the informed decision not to collect works made during directed art therapy sessions. Outsider Art differs from art therapy, which is considered by some to reduce the intensity of work by psychiatric patients who are compelled to create. Trained artist Edward Adamson, who opened his studio at Netherne, Surrey in 1946, assisted in the planning of the first course of art therapy in England and amassed a collection of some 40,000 drawings, paintings and other artworks produced by his patients. Only a small number of these works, however, bear the characteristics of Outsider Art. One of Adamson's patients was William Kurelek (1927­77), a Canadian artist of Ukrainian origin who travelled to England in 1952 in search of treatment for schizophrenia in the belief that he would receive better treatment there. Changes in clinical approaches to mental illness, which include the introduction of anti-psychotic and mood-altering drugs, are believed by many to have affected the creative output of mental patients. Few sufferers retain an urge to create so powerful that they reject therapeutic drugs in order to make art. Nick Blinko (b. 1961) is one such artist, choosing to spend periods without the medication that brings psychic stability but hampers his ability to draw, so that he may construct his microscopically detailed images. Raw Vision magazine first appeared in 1989, founded and edited in London by John Maizels to bring Outsider Art to a wider public. The broad scope of art highlighted in the magazine extends to the work of self-taught artists such as Vonn Ströpp (b. 1962), whose work is technically accomplished yet retains a remarkable visionary quality, Richard Nie (b. 1954) who began doodling or drawing on the notes and diagrams he produced when learning to play the guitar, and Ben Wilson (b. 1963), known for his wooden constructions, but currently painting miniature masterpieces on chewing gum in London's streets. In 2006, the touring exhibition Inner Worlds Outside visited three venues: La Caixa, Madrid; Whitechapel Gallery, London and the Irish Museum of Modern Art, Dublin. Curated by Jon Thompson, the exhibition aimed to seek out parallels between Insider and Outsider Art, and to highlight the impact of unknown Outsiders on some of the greatest names of twentieth-century art. This upset many within the art establishment, and the reaction of several art critics to the London show made it clear that as far as the establishment is concerned little has changed in the twenty-seven years since Outsiders was mounted at the Hayward Gallery. Numerous smaller exhibitions have taken place over the past decade or so, but Outsider Art still lacks a major, permanently accessible presence in Britain. The works of British Outsider Art presented here at Halle Saint Pierre celebrate the unique vision of a mere handful of the many highly original creators working away from the public eye in Britain today, and honour those Art Brut creators of years gone by to whom we look back with wonder and delight. A far cry from the Brit Art revolution, here are the intimate expressions of those unaffected by styles or trends. Their influence is filtering through ­ slowly seeping into the consciousness and creations of mainstream artists. We can only hope that in years to come these passionate creations will gain the recognition they deserve in their own country, and that in Britain there will emerge a permanent museum dedicated to the exhibition and study of which this art is so deserving.